Grammar: <boffen> [verb] [bofte, h. geboft]. Translates to: to be fortunate, to be lucky. 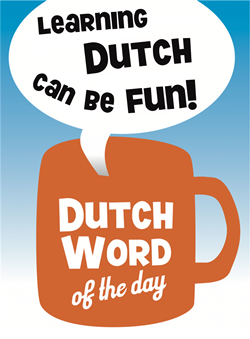 The verb "boffen" is a perfectly normal Dutch verb and you should know it, however it is somewhat informal and is often used when talking to children. 1. "Zo, jij boft maar!" 2. "Jullie hebben niet geboft met het weer!" 3. "Zij boffen met het uitzicht vanuit hun hotelkamer." 1. "Bofkont": one who is lucky/fortunate, mostly used for children. Literally: "Lucky bottom"
2. "Boffer" or "Bofferd": like "bofkont". 3. "De bof": the totally unrelated childhood disease "Mumps", see http://en.wikipedia.org/wiki/Mumps . 4. "Mazzelen": [verb] very informal equivalent of "boffen", derived from Yiddish "mazzeltov" (source Wikipedia). This entry was posted in Dutch word of the day, DWOTD 1.0, Vocabulary Intermediate and tagged boffen, geluk by Dutch Gurus. Bookmark the permalink.